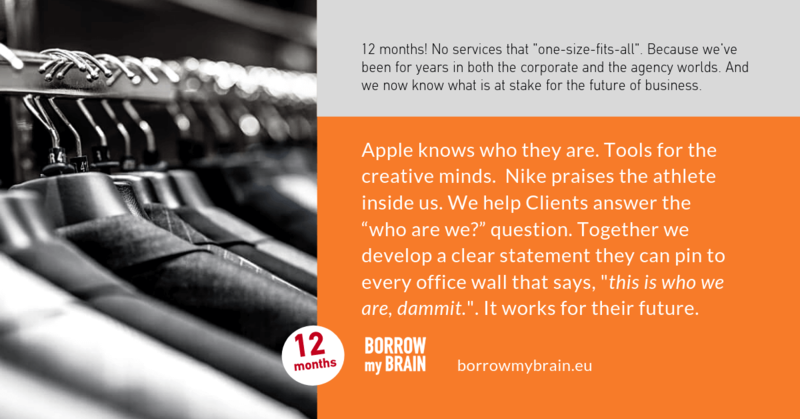 Borrow My Brain is 12 months old and scales with a purpose: to shepherd businesses into innovative, actionable ways for their Brands & Stories. We are now an agile tiger team, formed per project, to serve more in-depth our projects. A bunch of highly experienced, creative brains with a huge appetite for work and results in the transformation. And yes, we are aiming at you Mr. Startuper, Entrepreneur, Owner or Founder, and Marketer to support your Brand Navigation, Brand Storytelling, Brand Digital reviews, or consulting sessions, and workshops. 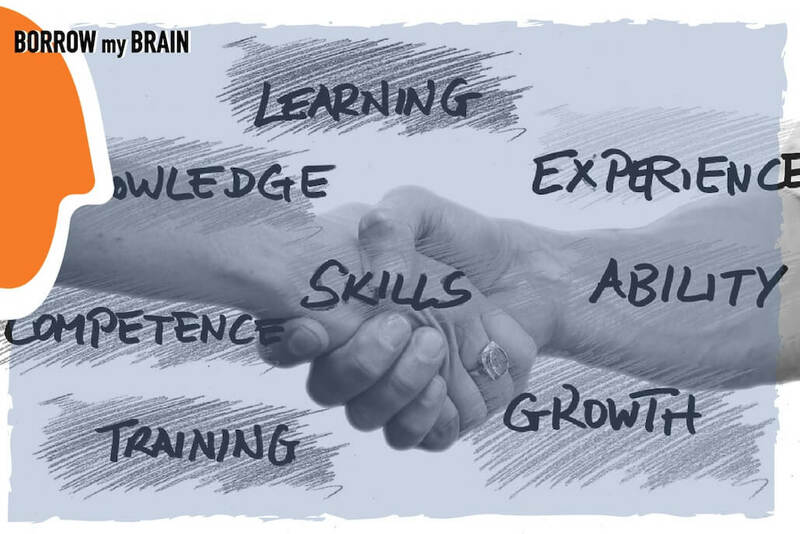 It was August 2017 when I’ve introduced Borrow My Brain with the blog post Now it is the time to startup #borrowmybrain. You can picture this, a bootstrap kind of new business, but with the right silent partners, a strong vision at heart, and a good business story. Within our limited marketing budget, I was doing the website, updating the blog, meeting and discussing with prospects, creating social media content and more. All these were learning 24/7, big time! The launch happened after my 4 full months of auditing 360 old-customers and partners. What’s going on in the market? What trends do you see? It was the wisest move of mine, coming out of the corporate world’s ‘safety-net’. From August to November 2017, I was still testing grounds, introducing the business story to prospects, trying to fine-tune the service deliverables and get some projects. I now don’t call them “Clients” or “Customers”. I will never do again. All are projects, and before that, they are People. Those who wish to improve and through their projects we improve as well. Projects and results. This reflects the innovative service design of Borrow My Brain: one-hour to support and transfer know-how. No retainers. We have to magnify the importance of adding value, instead of the “Customer” relationship, that implies a repeat purchase, an agony for recurrent revenues. The projects came from a diverse list of software, telecom, insurance, mobile, farm production, products of origin, service companies and agencies. So diverse, but all interested in revisiting their Brand experiences. We reviewed plans, re-worked content, did planning workshops and more. I was doing again the game I know best of all of my peers. It was the first time in my life that revenue was incomparably low satisfaction, compared to the value-add. Project partners and companies’ execs were giving me the biggest return and gratification: “Why do we pay so much in retainers and we don’t hear such views?” and “why do we repeat the same plan almost every year?” That was it! But why did they show Trust? Because Borrow My Brain is a good business story. Wait, before judging me for arrogance. I know what you are thinking. Let’s be honest, the web is full of ‘mumbo-jumbo’ type of mission statements, made up by company teams that wish to play safe. They offer nothing but themselves, or they copy-cat a certified procedure. They go mainstream, by repeating what others do. I call them ‘copy-paste’. Especially in the Marketing Communications industry, where Borrow My Brain operates, things are even worse. There are two poles: you are either an agency hunting for revenue volume or a freelance Consultant making a living by 1-2 “personal” clients. In both cases the quality of service, strategic depth, Branding understanding and expertise, true creativity are questionable; they all depend by the rigour, the experience, and the personal character of the person who’s delivering the service. We are a story worth …using! Against all these, Borrow My Brain is different. It offers actionable know-how (no ‘recipes’ that worked before). It comes prepared in a session. Offers tons of free content and free consulting sessions by doing your Brand Health check. Why? To ignite the economy in the EMEA region and our dreams again. 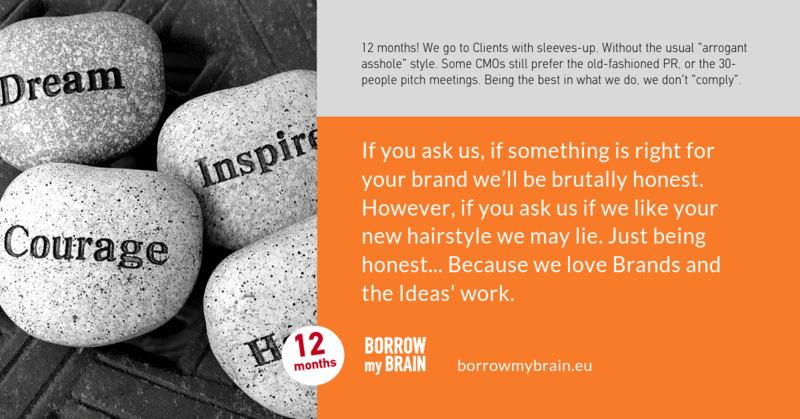 Borrow My Brain serves big corporations with the promise to help them stop repeating themselves and build stronger Brands (back in the old days they had tons of money to buy awareness and that’s all), and smaller businesses that must fascinate their audiences and spark measurable actions without almost any money. Our story is about a journey that businesses do -with us- knowing who we are, and the emotional ‘buy-in’ isn’t how “big” we are, but how useful we can be. As a toolkit. As the doctor, you visit once to ask an opinion. Companies that reach out to us, tell me that they feel better already since we don’t have time-wasting meetings or hierarchies and delays. We’re not in the 1950’s. This is the power of our story. And we will turn it into a movement. Some stories sound like fairy tales, and you may think our story isn’t fascinating enough. But, oh yes, it is. We have partnered with great people that have built their transition and own businesses in the online era, without losing the respect, desire, passion for contributing ideas to the business world. We have partnered as an agile team, formed per projects, but we feel like Jobs and Wozniak when building their first computer in a garage (we wish!). Now we scale as the business plan has it. After 12 months we’re ready to ‘rock’ the Marketing Communication industry’s complacency and routine. ‘Hit & run’ in an hour. Write and provide in an hour. Workshop to make people become creatives again. Plan for Brands & Stories. The problem: businesses ‘jump’ into execution or ‘going digital’, or hunting for top-line but through this routine, they have neglected the Brand foundations – the Brand is the only answer to all business challenges they have. How do we fix this: Borrow My brain is a ‘doctor’ for Brands & Stories. Fix the small things that have huge importance for companies. On-call, ad-hoc, ready to answer to issues that (the high-OpEx) agencies will desire a huge premium compared to real achievements. Mission: We shepherd Brands with actionable ways. Working in the foundations. How Brands look, talk and behave, off-and-online. All claim legacy, leadership, customer-centric …old-school irrelevant. We know that leading a business is a sane journey, but you gave a Promise, right? To serve and move them. We look now to innovation, change programs, customer marketing/CX, Content. For these, we review or enrich plans (tactics, PR, online, sales, crisis) and train people. Brand Navigation services help B2B, Consumer, and Nonprofit organizations position and convey what their brands stand for – clear, simple, consistent. We help them answer their “who are we?” question. We develop a clear statement they can print out and pin to every office wall that says, “this is who we are, dammit.” Hourly sessions, plan reviews advisory sessions, or planning workshops. These services are orchestrated by Stefi Vasilopoulou and myself. Stefi is an Entrepreneur, Consultant, and Angel investor that, in the last 12 years, she has founded innovative ventures. She brings enthusiasm, critical thinking, and synthesis skills combining Branding, Marketing, and 360o communications to the project at hand. One hour=360o answers as we say. How much do I fancy her fast-paced ideas’ bombardment! We often tell, that the keys to brand success are definition, transparency, authenticity and accountability. To people that you wish to influence. In the ‘mumbo-jumbo’ digital economy there are millions of juniors (sorry interns! ), that use the term Storytelling because of their Instagram stories and their handheld video-shooting “skills”. Our Brand Storytelling services are helping companies to plan, strategize, and craft (yes, we write) stories in all their channels. Employer brand, Internal communications, Crisis preparedness, Pitching a story, Editing sales materials and many more. To make sure the Brand storytelling will be a complete picture of facts, feelings and interpretations of the company/brand shared right by customers, the public, your people, and online groups companies need Creative pens. Anna Malliarou has the lead for Content Creation in digital activations. She is experienced by many multinational advertising agencies, and a sharp pen to write ‘turn-head’ lines. The strategist she is and her mind twists solve business issues with creative expressions. She inspires people to push forward their ideas and become more expressive. We have in our team another strong ‘link’: Aspa Tsamadi, a professional blogger, the founder of aspaonline.gr community and the owner of aspatsamadi.com (teaching people how to create online). She advises companies on how to develop their blogging as a means for reputation, growth, and revenue (this is very critical now that Google and Facebook have become so complicated and expensive ad channels). With her infinite positive approach and confidence, she coaches the company teams how to conceptualize themes and narratives for their own media. Another excellent pen that sets the standards to blogging. The team in one of our Brand Foundations Planning workshops. If you don’t have a digital presence today, you don’t exist. The concept of the Brand in the online environment is difficult to tackle because although many people argue around the website and social, factors such as physical delivery, returns, value-exchanges, benefits, interesting and activating content, services’ support are important. How do you plan all these on the opportunity of a website? How all these are combined in the company’s online presence? To build a stable foundation, you need to address four unique and interrelated components: content, strategy, design and technology. Your focus on each of these must be in equal and measured parts, ensuring a balanced approach to your digital presence. Think of these components as four table legs. We offer Brand Digital services to help small-medium size companies plan their presence, strategy, and content before they get troubled by the tenths of digital ‘gurus’. Save them on costs, and risks. Give them a Marketing strategy that can be digital 360o. Despina Exadaktylou is with us to turn Digital into plain language. She advises Companies, and Startups on Inbound, Product and Growth Marketing solutions. A competent digital marketer with heavy experience in Martech, content strategy and a flair for new growth techniques! Being a multidisciplinary team in consulting for the key touch points of the brand experience, we needed our developer, to coach decisions before doing a website, or an online activation. Aggelos Asimakopoulos is with us because of his attitude and skills. He is a Developer, Network & software consultant, HW engineer & Consultant. Has worked for numerous projects (Web development, PHP, MySQL, CSS, WordPress, e-commerce platforms, as well as software testing). Delivering value. Making sure that Brands speaks about what matters to people while serving their targets. Enhancing people lives so they can return to the Brand’s places. We ask no long-term commitment, only open minds to receive a different view on what they do every day. Revisit their end-customers’ world. Think smarter before execution, so it can be effective. Secure ROI, without paying “seniors” costs. We will keep the spark alive. The Creativity spark. For better ideas. For sharper messaging and company transformation projects. From a new product, up to re-shaping an entire operation. This is why we unite. To give-back importance and relevance to the Brand. Because we are the best in what we do as our 10 why’s describe (yet, humble to serve). This is us… a bunch of highly experienced, creative brains with a huge appetite for work and results in the transformation. And yes, we are aiming at you Mr. Startuper, Entrepreneur, Owner or Founder to consult and support you and your Brand with bespoke services. With views and actionable input on Brand Navigation, Storytelling, and Digital. Offering hourly reviews, strategic consulting sessions, and workshops. To share your vision. Tell your story. Lead you steps forward to where you want to reach. Transforming your presence and conversions off-and-online. You need new ways. After the transformation’s first ‘wave’ only 40% of the companies and models we know, will have survived. Don’t go alone out there… Borrow Our Brains!